In 1989, two months after Thom Bierdz first left the soap opera The Young and the Restless, his youngest brother Troy, later to be diagnosed a paranoid schizophrenic, beat their mother to deaht with a baeball bat in her Wisconsin home. While Thom Bierdz disappeared from the public eye, he lived a life of silent horror and analysis, dissecting his early haunted years and trying to understand why a brother (or two) would become a killer. In a raw and embarrassingly honest tome, Bierdz ugly secrets and finds a way to love and forgive his brother, and rebuild a broken family with broken people. The complicated Bierdz is as far away from a typical soap opera actor as one could. The critically-acclaimed book has his expressionistic paintings scattered throughout, giving the reader a visual to experience the heavy emotional story arcs and sublime joys. I requested this book because of my early years spent watching so many episodes of The Young and the Restless with my Grandma and my mother. It was definitely a staple in my household growing up. Though I have not watched it for some time now, my mother is still a huge fan. Recently Thom Bierdz returned to the show, reviving his character of Phillip Chancellor III, who had been dead for twenty years. This pleased my mother so. So, I felt my mother would be best for reviewing this book. She got so excited at the chance to read it and though she may not have any experience "reviewing" books, she is a passionate reader and very honest in her opinions. I got my love of reading from her and her and I discuss books during every phone conversation we had. She will be passing this book on to her circle of friends and readers to share Thom's story. "I was anxious to read this biography Forgiving Troy. I have watched The Young and the Restless" for years and remember Thom playing Phillip Chancellor. I found out through a return visit to the show that he was also gay, something that was not known to me when I watched him years ago. To me this was a very moving, yet sad story. How Thom could still love and forgive his brother Troy after what he did showed great strength. What talent Thom has with his art work, showing such sensitivity. What talent he has to look at himself to see just what he is really like inside. His overcoming this terrible tragedy and being able to forgive is an amazing thing to me. It was such a pleasure to see him again on the show and I continue to think a lot about his life and story. I strongly recommend this book, not only to fans of The Young and the Restless, but to those who appreciate a honest, unflinching memoir." The book is available at www.ThomBierdz.com. 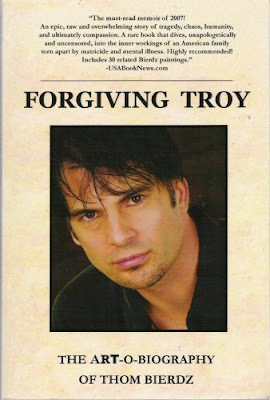 Hailed by celebrities and even the Chief of Psychiatry for the Federal Bureau of Prisons in the U.S, the 2010 International Book Awards honored Forgiving Troy with the Spirituality "Sacred Light" Award, winner in Autobiography/Memoir category, Gay and Lesbian:Non-Fiction Category, Non-Fiction Narrative category, and True Crime:Non-Fiction category. Thank you to Thom for sending me his book and sharing his story with all of us. Great review Mom! I was so tempted by this book and was disappointed that I had to pass on it because of too many other obligations. Sounds like I should have just made time for it. My Mom and I used to watch The Young and the Restless as well during the early '90s. What an incredible and sad journey that this individual has gone through -- and impressive that he could forgive and try to move on and repair what he could with his family. I'm not sure that I could have this type of strength, you know? Great review! I don't know anything about this actor but it still sounds like an interesting read. I can't imagine everything he has been through.